Review: This Y cable does what it's supposed to do ... but I did find that not all intercom systems have enough oomph to make both connected headsets "normal." Audio reception isn't a problem on those systems, but spoken transmissions require a bit more force from both parties. My guess is the mic intake across the two in sum remains the same while each headset effectively gets half. Before you assume that's a train wreck ... it's not. I keep this little gem in my son's headset bag and we've used it enough times to pay for itself for sure. Also can fiddle with intercom gain and effectively mask the problem enough. Certainly easier/cheaper than toting around one of those portable intercom systems, though I'm sure they work great. Five stars for construction, mission success, and MyPilotStore for being fast, accurate, and friendly. 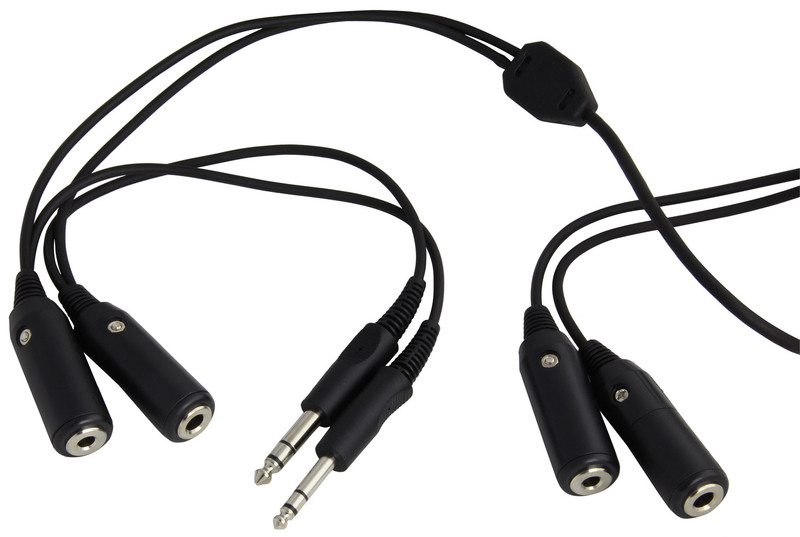 Review: Durable and practical item when an additional headset needs to be added to the system. I did not notice any significant loss in volume. Review: Perfect solution to my 4 place system to give passengers 5 & 6 the chance to join in listening and talking during our flights. Q: 2 questions: 1) Will this work for an observer of a two-crew cockpit whereby the observer will be able to hear and talk to both crew members? 2) How long is the cord from the male jacks to both sets of female jacks? Thank you. A: Yes, this adapter will accomplish what you are trying to do. It will allow the rear seat passenger to hear and speak via the intercom. Unfortunately, the other mic will also be hot when one of the two people uses the PTT. From end to end the cord itself is approx. 5ft long. Q: Double Headset Y Adapter - I need an adapter that will allow the rear seat passenger to hear radio transmissions and be able to communicate via the voice-activated intercom. He does not need to transmit on the radio. Does this cord do that. Also, need to make sure it doesn't affect the pilots ability to use his push to talk switch for transmitting on the radio. Are both mics live when he pushes the talk switch? A: Yes, this adapter will accomplish what you are trying to do. It will allow the rear seat passenger to hear and speak via the intercom. Unfortunately, the other mic will also be hot when the one of the two people uses the PTT.